← Investigate Wowmall Theme Thoroughly. Get a Bunch of Video Tutorials. 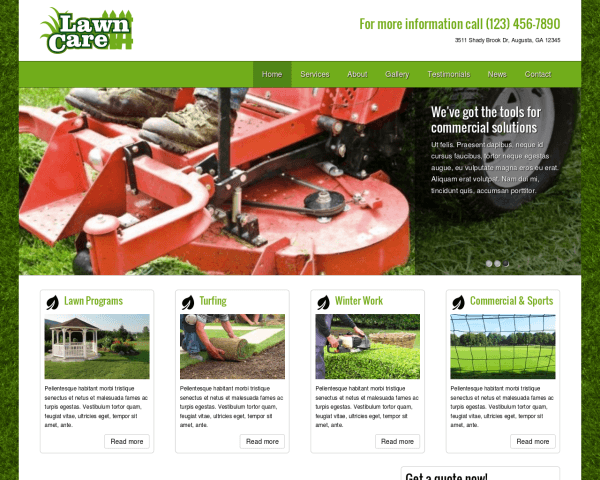 Our current post is dedicated to templates’ comparison that were created for Lawn Care Service products. Huge number of sales. Your site will not be unique. Hosted solution, MONTHLY PAYMENTS (year $145), limited functionality, compatibility only with Wix webservers. Nonresponsive. MOTO CMS- is quite specific in use. It is not popular. Support and update may be dificult. Requires php knowledge and experience. Expensive customization service. VERY EXPENSIVE!!! MOTO CMS- is quite specific in use. It is not popular. Support and update may be dificult. Requires php knowledge and experience. Expensive customization service. Very old design (from 2005), flash header, nonresponsive, nonworking contact form, old html4/css2, bad SEO and indexing from Google. Monthly payments, unkown functionality, There is no opportunity to check real demo. Which features of the template can be descibed as the most important? However, the right choice is as always on your side. This entry was posted in Promotional offer and tagged website template. Bookmark the permalink.